In 2008 Thinking Flowers? collaborated with Catalyst Fund Management and Research – now called Clearly So. A company very much in line with our ethos, Clearly So helps social entrepreneurs raise capital in order to grow the social investment marketplace and help build a more social economy. 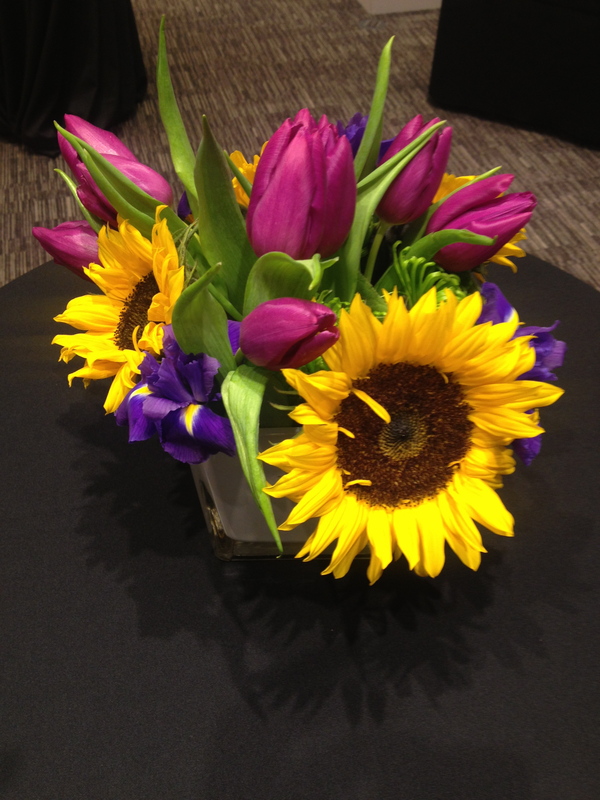 I was commissioned to provide table floral installations for their Social Business for CEOs conference. In contrast to many social sector conferences, Clearly So focused on providing practical advice for the day-to-day business challenges and opportunities facing senior managers in this growing sector, not just on networking. Clearly So still provides regular monthly sessions, A Tea Time Q&A, for anyone from budding to fully-fledged entrepreneurs to attend with questions, problems or just to listen in on advice and trouble-shooting. Their next session is on March 12. The installation we created for them encompassed the nature of their mission to be a catalyst for social investment, mirroring our desire to create global change by positive investment in ethical supply chains. All flowers were selected by ethically sound suppliers Fair Flowers & Plants. 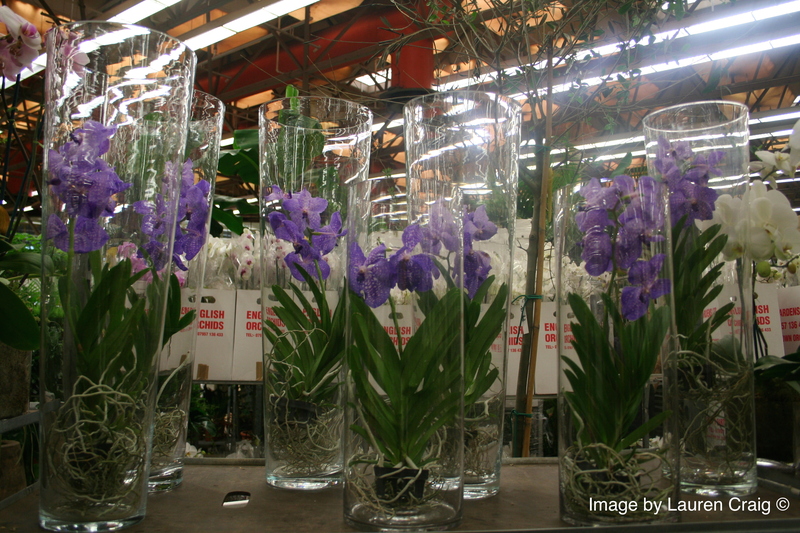 The installation was designed using purple and white Vanda Orchids, reflecting the former colour scheme of the company. The orchids would rest in glass globe-like bowls which represented the planet, its circular movement and the idea of continuous change which we believed complimented the type of work done by Clearly So. 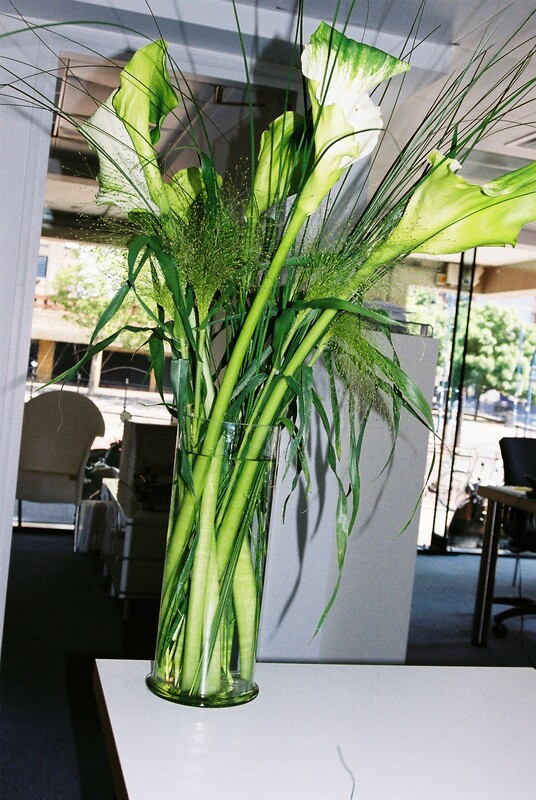 The Enterprise Centre for the Creative Arts, now known as Student Enterprise and Employability for UAL, was one of our first weekly contracts and was exactly the type of venture that Thinking Flowers? aimed to collaborate with, bringing together our fields of interest – creativity and business. ECCA gave its users the opportunity to innovate and supported them through mentoring, funding, seminars and practical business workshops. 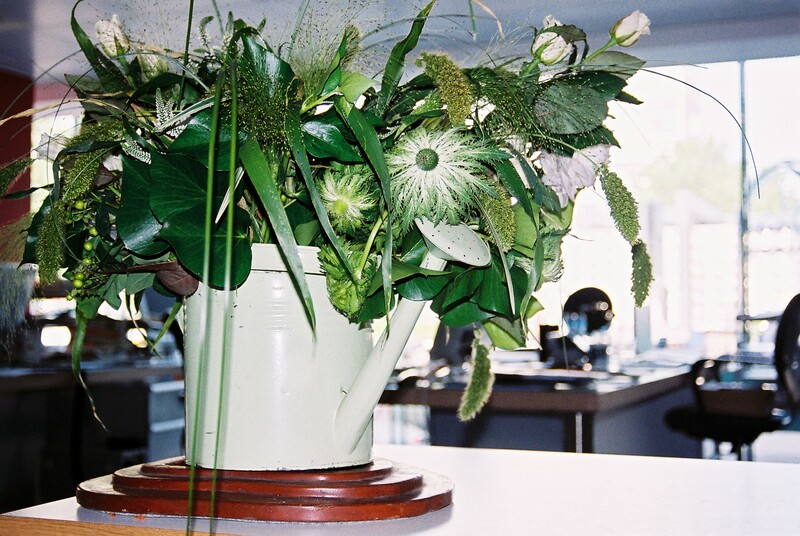 In 2005, having noticed the beautiful glass corner office they had, located inside the London College of Communication building, I pitched with them for a regular table top floral installation. We thought it would be a great opportunity for our designs to be widely viewed and to create a positive impact for the staff and students. The contract allowed deep critical thinking around the design, aesthetics and influence of the environment on our installations – ie. site-specific designs. 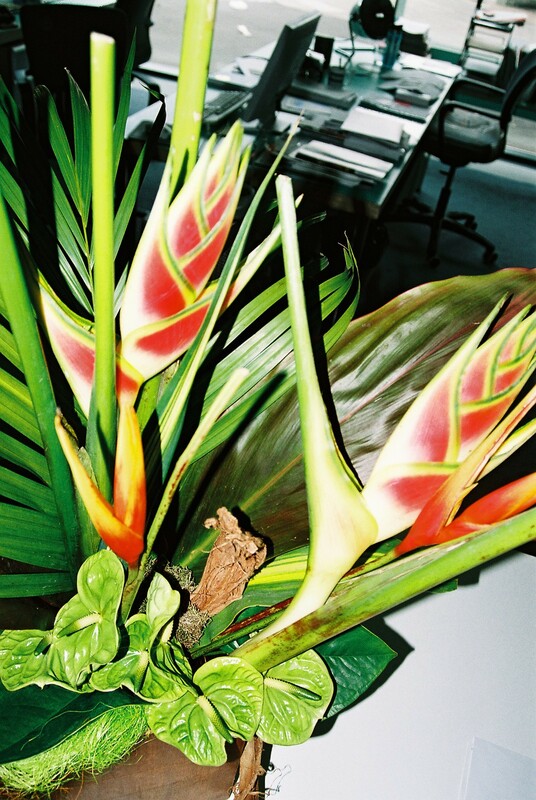 In addition we could think about the purpose of flowers in our work spaces and how we could combine our installations with the ethical practices that embodies Thinking Flowers?. While a decade ago the idea of ethical practices that involved both social and environmental concerns may have seemed out of place in the business world, and were perhaps a little wacky at the time, Marice Cumber, who was the director of ECCA at the time, nevertheless gave us a chance. We were nominated for the ECCA’s Best Social Enterprise of Ethical Business Award in 2010. The images below are a selection of some of our favourite table top installations. The space being quite clean and open allowed for a lot of experimentation. 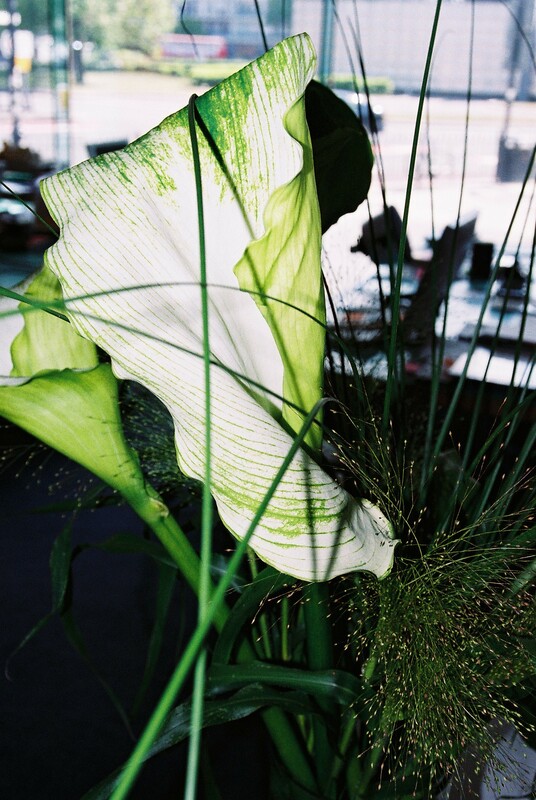 We were going through quite a green period and used tall elegant green goddess calla lilies and steel grass to form layered textures in different hues. The office interior was sleek, modern and with colourful highlights, yet remaining somewhat industrial. 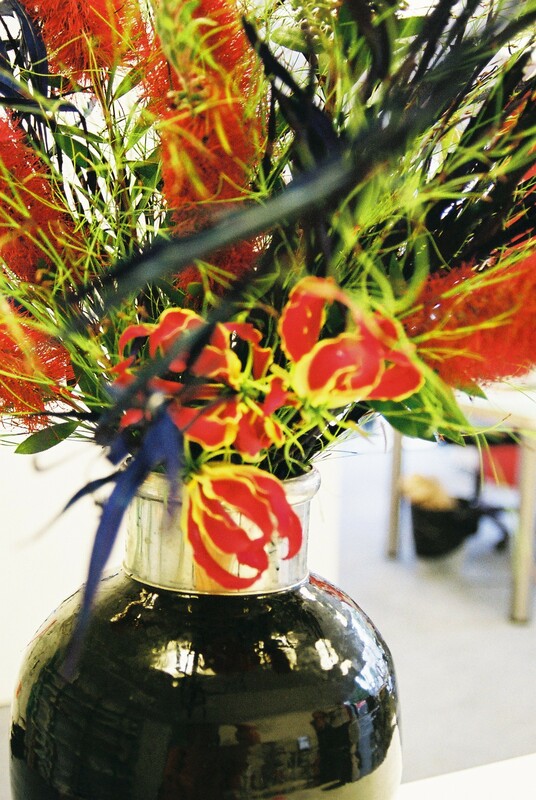 Reflecting this in the above design, the use of the black vase suggested black ink in the context of an office environment and contrasted with the bright gloriosa lilies which bring light and colour to the room. The use of inky blue gervilla fitted with the wispy language of the emu grass (asparagus fern) and bottle brushes. 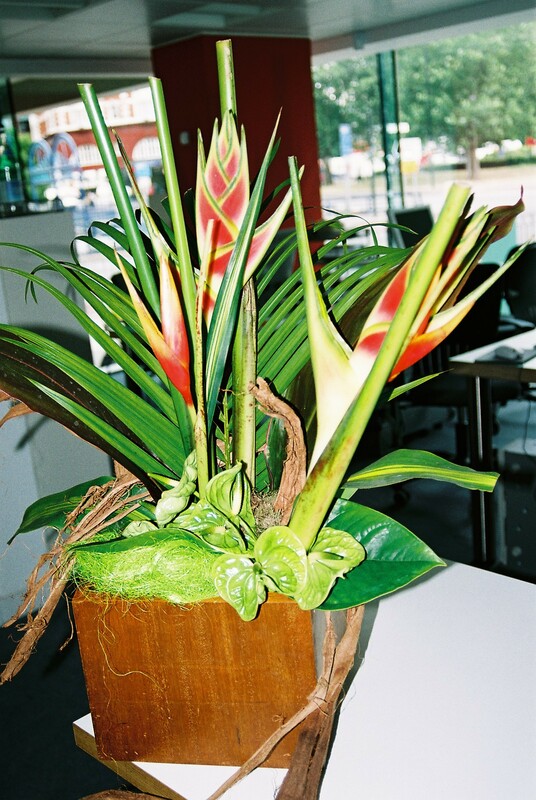 Tropical plants such as heliconia and anthurium were common in our designs at the time and we still love to use the Rainforest Alliance for these, for example in at the V&A Fair Trade Floral Design workshop that we curated. 2004 was the year things really started for Thinking Flowers?. 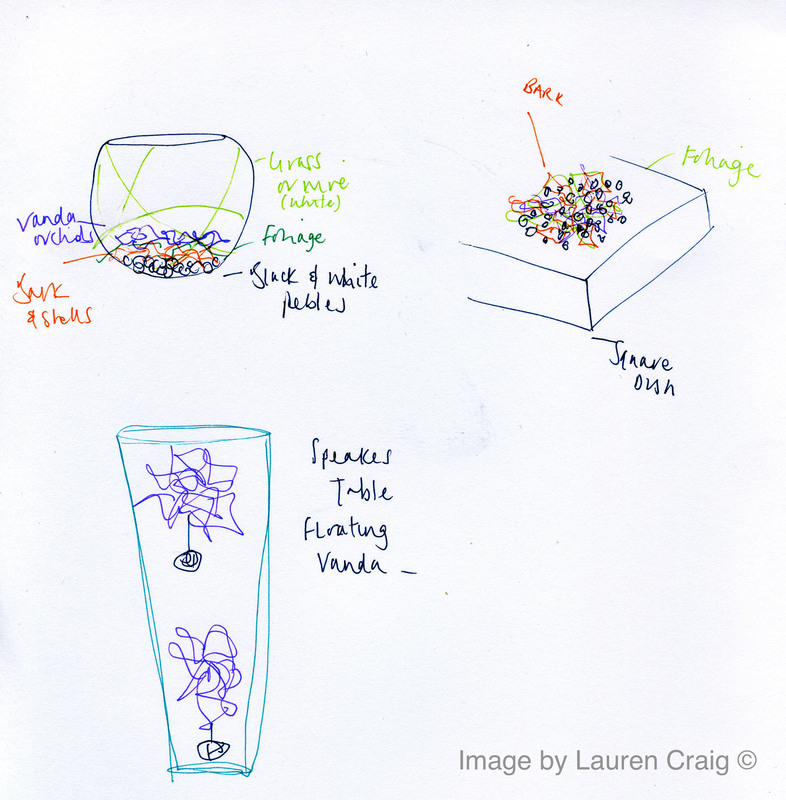 Through working with flowers the opportunity arose to pitch a floral design concept for the inauguration celebrations of University of the Arts London, formerly known as the London Institute. There were quite a few celebration dinners at this time, one was a traditional affair for the inauguration ceremony at the Banqueting House at Horse Guards Parade. In attendance were several UAL alumnae such as Stella McCartney, Alexander McQueen and Vivienne Westwood. This was particularly meaningful for me as a UAL alum myself! The success of the dinner led to a string of private commissions for underground fashion parties and exposure to elements of the surreal, the bizarre and the extraordinary. My mind was opened to the opportunity flowers could bring to create and connect different realities. Designing with flowers for the inauguration ceremony was mind-blowing in some ways because I’d never had to respond to another art form – in this case, I was asked to incorporate the aesthetic of the hall’s Reuben ceiling. 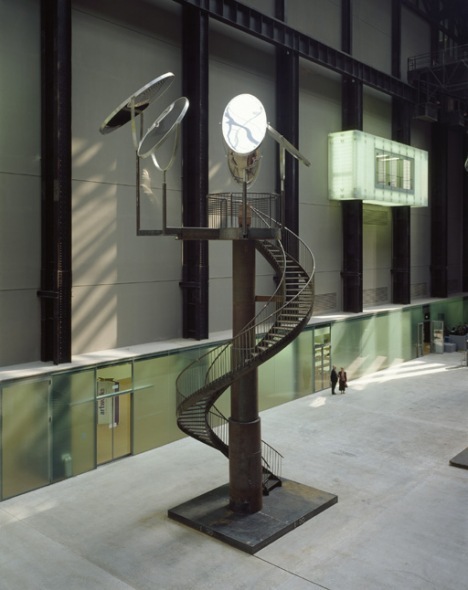 On the contrary, designing as a response to industrial and urban environments felt like second nature when coming up with the concept for the inauguration dinner at the Turbine Hall of the Tate Modern. 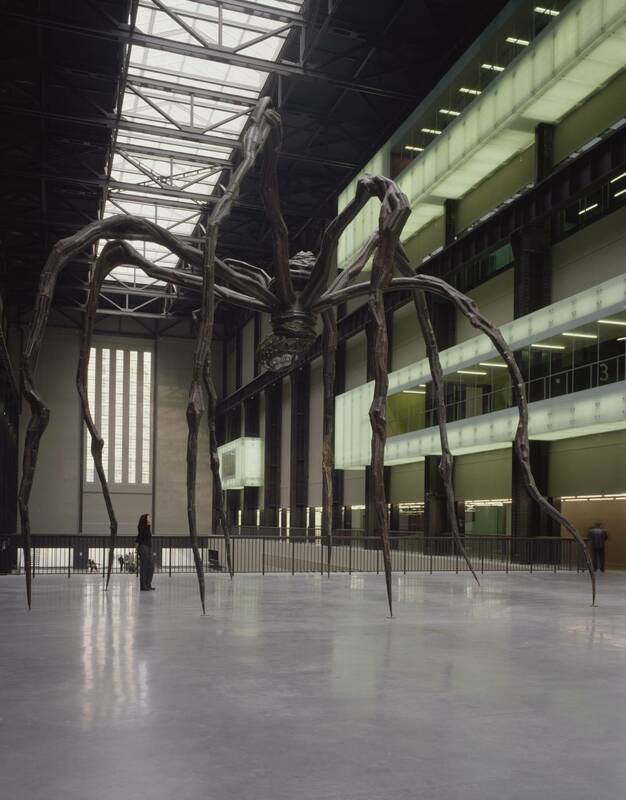 The installation in the hall at the time was Louise Bourgeois’ Maman. An overwhelming series of giant spider sculptures with full egg sacs that explored the kindness, cruelty and fragility of motherhood. I didn’t realise the enormity Bourgeois’ work would have as an influence on my life as an artist. Her interpretations of gender in her sculptures still resonate with me today. I chose to use green anthuriums because they were pretty absurd to have as a buttonhole. The use of the pink roses at the bottom of the topiary tree almost seem as though they could be normal table arrangements. 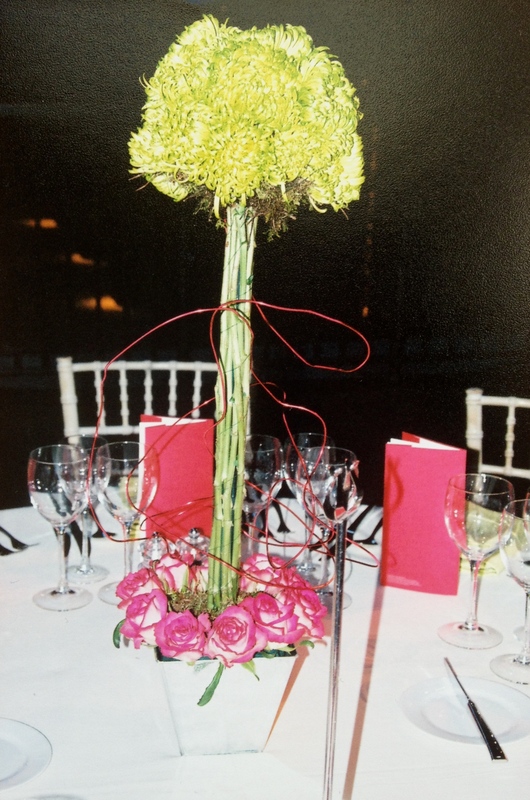 Similarly, the designs for the table arrangements were about poking fun at the topiary tree and giving it more of a space-age feel, in line with the large industrial feel of the hall. I took inspiration from a self-directed table setting I had created some time before. 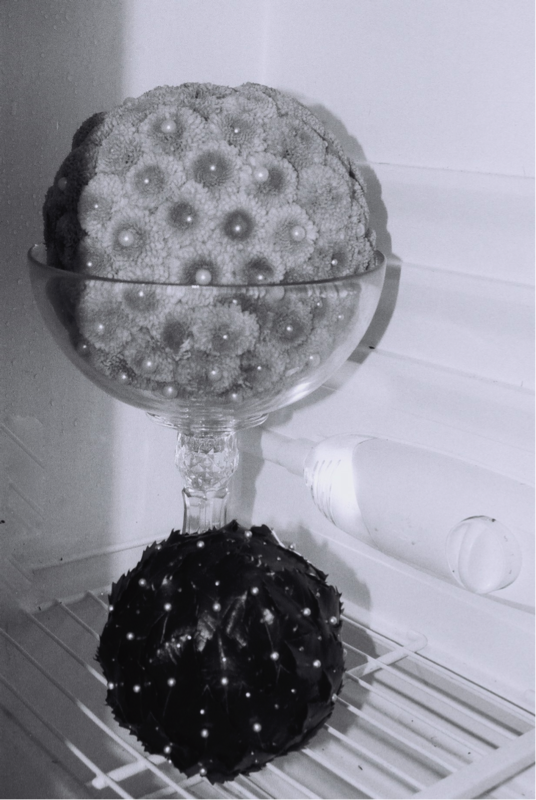 After a while in our dusty photographic archive, the Thinking Flowers? blog is back and better than ever! In the coming months, we are going to be delving into the past to find old commissions and projects to share in order to create a complete digital archive of our work. Prints [both framed and unframed] will be available on request. Thinking Flowers? 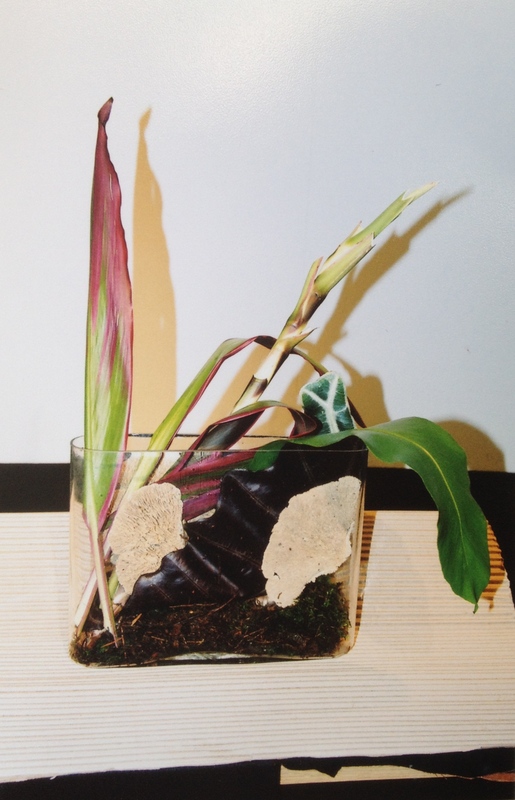 has always dedicated itself to providing meaningful, minimal and modern floral installations through ethical and sustainable practices. 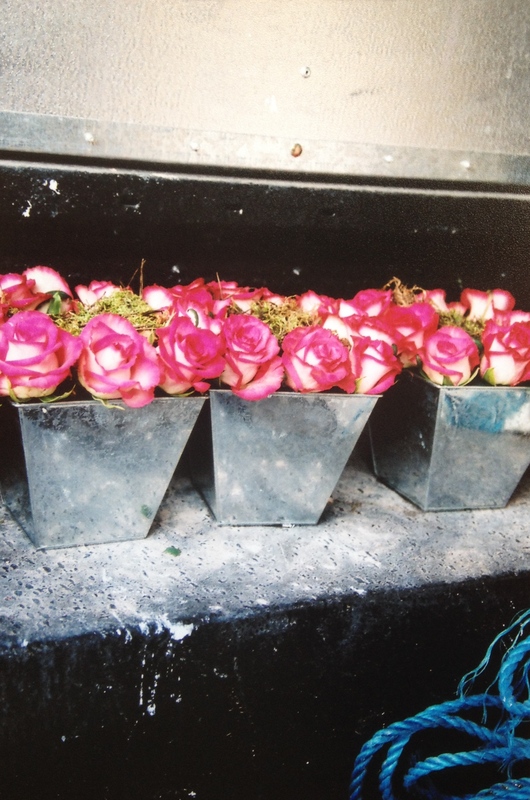 We have seen an increase of interest in these areas over the last 11 years and we hope to map the physical and social impact that our ethos and practices have had not only in the cut-flower industry but the intersections of social enterprise, visual arts, global business and community engagement. It is with this in mind that we want to create this archive to share our experiences and findings in order to support future designers and artists. We always try to find beauty, life and wealth in discarded items and wherever possible to recycle and repurpose material. Through the gradual unfolding of the archive, we hope to demonstrate how and why modern, meaningful and minimal design principles have been applied and furthermore, how we have used floral installation to create site-specific opportunities for people to engage with our work and with each other. It can be hard for us to see how and why this artwork, its process and its context is essential and groundbreaking when flowers are so commonplace in our everyday visual landscapes. 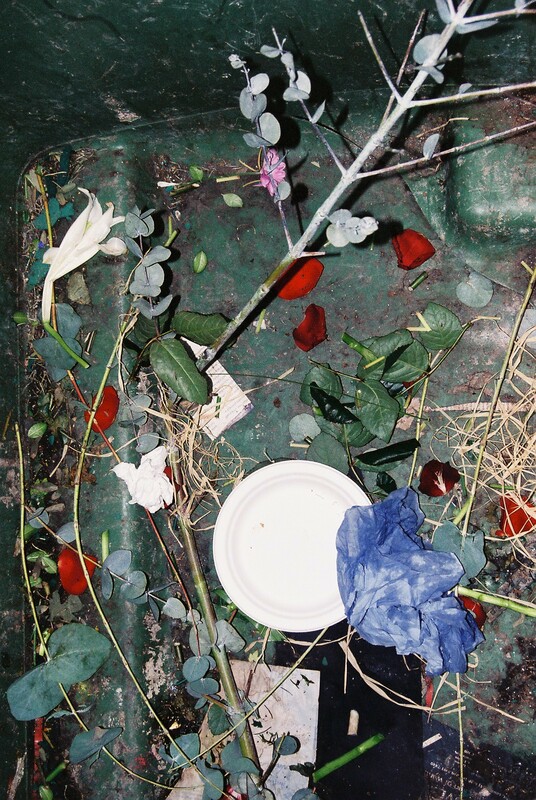 Even such terms as ‘floral installation’, ‘upcycling’ or ‘green waste disposal’ have only become popularised in the last ten years or so. But we hope by sharing our images and information and our projects that we can map the construction of floral installation and how it has evolved over time. We’re really looking forward to the Bloom and Bust: Trends in Floristry event at our local Garden Museum on 23 April. This talk is part of an ongoing exhibition called Floriculture: Flowers, Love and Money, which was opened by HRH the Duchess of Cornwall on 14 February. Supported by the Covent Garden Market Authority and sponsored by Waitrose, the exhibition looks at use of flowers in art and life from historical times to the present day. We’ve very happy to be part of this coming together to celebrate and explore the importance of flowers. 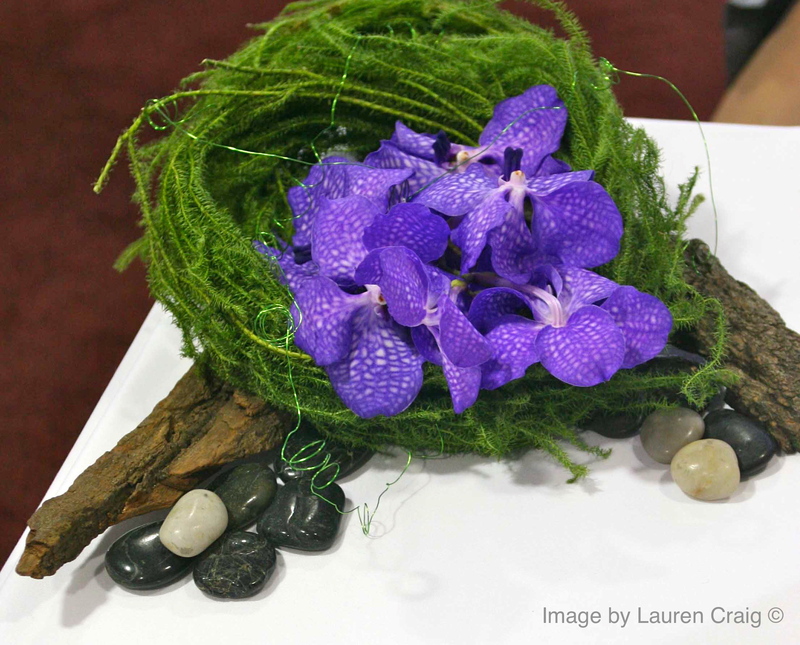 Lauren will be sharing her personal and professional thoughts, ideas and observations on past and current trends in floristry. The event is open to the public and there are still tickets available. Lauren will share some reflections about the event soon. The House of St Barnabas is an exciting venture to ensure sustained employment for homeless people by creating revenue streams through venue hire and hospitality that provides work-related experience and jobs. If you haven’t had a chance to check out HoSB, please do make an effort to enjoy this beautiful space. Its fantastic history and aesthetics have made many a magical event. As a precursor to HoSB becoming the first social enterprise members club, it has opened its doors for a mix of banging music events and stimulating discussions. Please do go along to one of their Spring Culture Series events. We were lucky enough to be commissioned to provide the floral installations for last month’s soirée – ‘A Mighty Big If’, hosted by magnetic Richard Strange, who said to us, “Ooh, they’re lovely flowers! What are they thinking?” The event was jam-packed, with words from Brian Cox and David Coulter captured by HiBROW TV. We are providing the flowers for their next event: HoSB and Moshi Moshi present Martin Creed, Slow Club and Sweet Baboo. 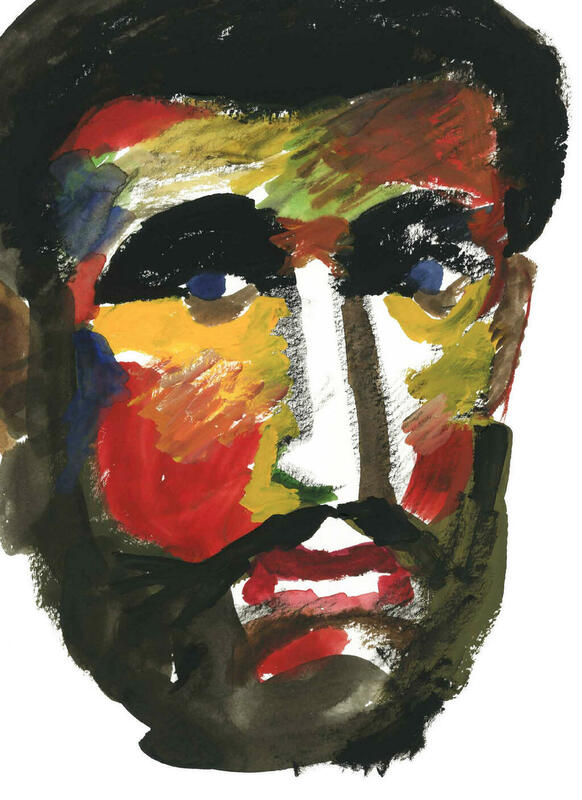 The event will be hosted by Turner Prize winner and musician Martin Creed, which has Lauren very excited, particularly as he has created a poster especially for HoSB – a beautiful watercolour of the saint’s face. Our brief from HoSB was to keep this amazing piece in mind but also be fairly elaborate. The new decor for the venue is pretty top secret so let’s hope we can get some pictures in situ for you this time. There are plenty of events coming up for which you can still get tickets. We are looking forward to The Secret Meaning of Shoes with the ever-knowledgeable taste-maker Ekow Eshun, Miranda Sawyer (our lovely and local journalist) and, of course, Mark Hare (we like that pair). It’s only a tenner – get in there! 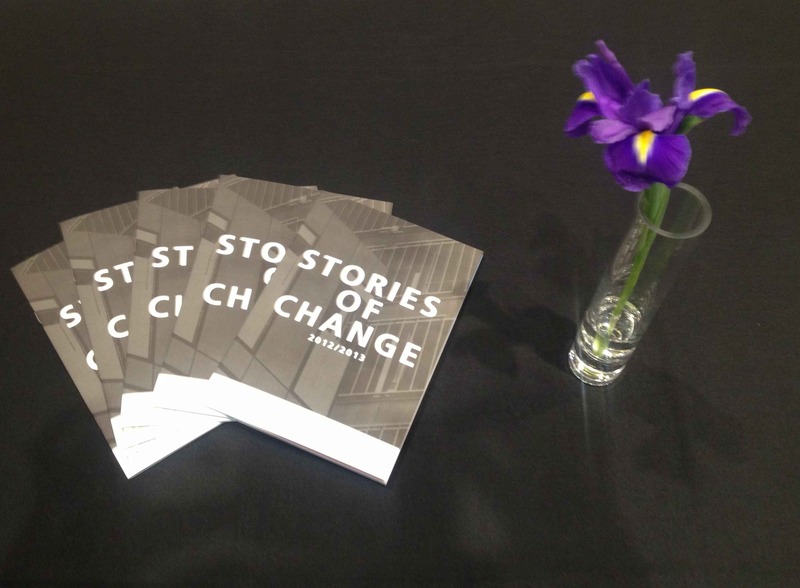 This event as always brings together the mighty spirit of those brave enough to dare challenging the status quo with those who are similar but working within the financial services. SSE provides a platform for the learning and development of those that graduate from the programme and the tools and support for the enterprises they start. Among the award winners, special mention should be made of Lucy, who overcame the barriers of homelessness to acquire 11 acres of land on which she will build a homelessness rehabilitation centre based around land-based learning and acupuncture, and Ian from May Project Gardens, which is starting a permaculture garden in Morden with the aim of bringing communities together through ecological and ethical activities. We were asked for something bright, cheerful and celebratory because this year’s ceremony was earlier than usual. We chose white glass vases and clear glass for the long-stemmed irises and, keeping in harmony with the SSE colours – magenta, gold and blue – we thought sunflowers were fitting to represent their logo. We used the irises to represent vision and fidelity, which we feel is needed for those who take a social or environmental entrepreneurial path. Floral donation went to the Karibu Centre, Gresham Road, Brixton, which allowed for the space to be dressed for the funeral of a young male victim of violent street crime. Elaine Holness, the director of the Centre and an SSE fellow, continues to create an accessible and safe environment for the Brixton community to hold meetings and events.